The European Court of Human Rights (ECHR) has rejected over 25,000 cases following the 2016 coup attempt. The rejections are justified by the ECHR requirements that national remedies must be exhausted for cases to be appealed to the court. The Rule of Law in Turkey today has been severely eroded. Lawyers, judges, prosecutors and journalists have in great numbers been dismissed, silenced and prosecuted. Many of them have been detained and sentenced to jail varying from 6 to 15 years. 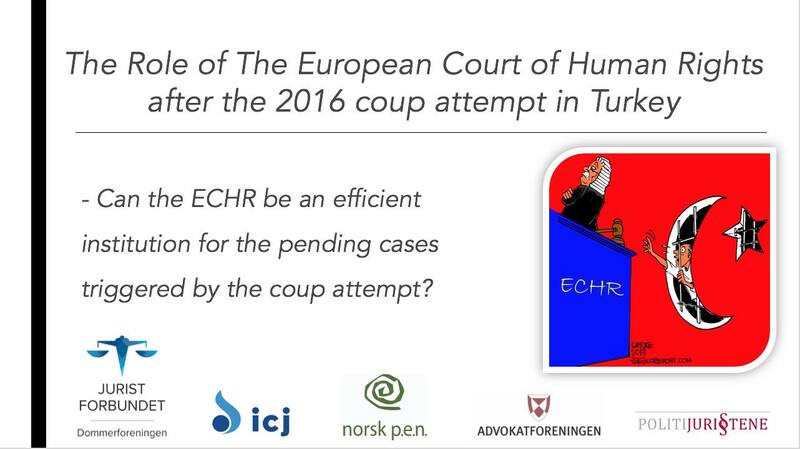 Can the ECHR be an efficient institution for the pending cases triggered by the coup attempt? The seminar is open and free of charge. Arrangører: Norsk PEN, Dommerforeningen, ICJ Norge, Juristforbundet, Advokatforeningen og Politijuristene. Firstly, we, the undersigned, express our deepest sympathy to the Turkish people after the latest brutal attack in Ankara. We are extremely concerned about the increasing climate of fear and censorship and the stifling of critical voices in Turkey. Freedom of expression is one of the most frequently violated rights in Turkey. According to statistics by the European Court of Human Rights (ECHR), Turkey single-handedly surpassed the 46 other states in the Council of Europe (CoE) in terms of cases involving violations of the right to freedom of expression in 2014 and 2015. Turkish authorities are persecuting citizens that exercise their right to freedom of speech by criticizing the Turkish president and government. Judges, academics, writers and journalists are imprisoned. Many journalists are imprisoned because of their critical articles, and even more writers and journalists are awaiting punishment for having performed their duty towards society. Prosecution solicitors, having investigated allegations of serious corruption in President Recep Tayyip Erdogan’s family and associates, have lost their jobs and been prosecuted. Judges have been jailed because of their rulings. Academics, who asked the government to resume the peace process with the Kurdistan Workers’ Party (PKK), have been accused of supporting terrorism and several of them have lost their positions. We regret to learn about the police attack on the offices of Kurdish PEN in South East Turkey on 2 February. Rohat Aktas, editor of the Kurdish daily Azadiya Welat was killed 24 February while reporting from Cizre in southeast Turkey. Both leading international human rights organizations, the Council of Europe and the EU have strongly criticized the Turkish authorities. In the Reporters Without Borders’ ranking of press freedom in the world’s states, Turkey holds a dismal 149th place out of 180. Freedom of expression – a right enshrined in Turkey’s constitution – is the cornerstone of a democratic and fair society. For a society to be open, free and diverse, individuals must be able to live without fear of reprisals or censorship for what they believe or express. – Release all other writers and journalists detained or on trial in violation of their peaceful exercise of their right to freedom of expression. – Conduct a swift, transparent and thorough investigation into the death of Rohat Aktas and urge the government in Ankara to look for a peaceful and diplomatic solution to the conflict in southeast Turkey. Les også en samlet juriststands brev Børge Brende, der de ber Regjeringen om å reagere overfor Tyrkia – her.